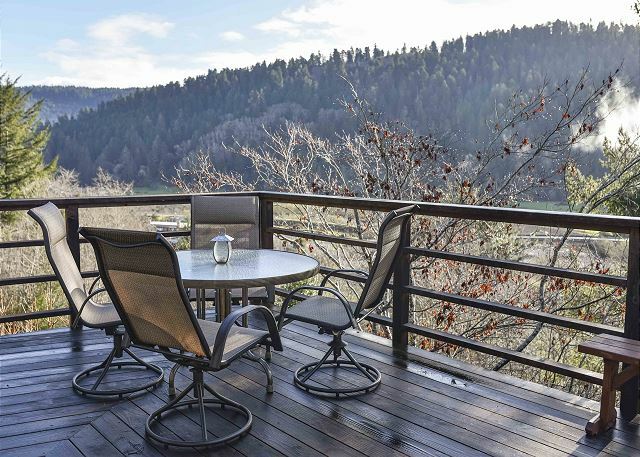 Set atop a quiet hillside overlooking the Pacific and the small town of Orick, a short drive to the Redwood National park, this three-bedroom quiet family home is the perfect place to come escape the hustle and bustle of the busy work world & city life. Beautiful and simple inside out, the house is single level with only a couple steps to the door. The midcentury furniture is stylish and really accents the warm, comfortable setting where you are surrounded by nature. 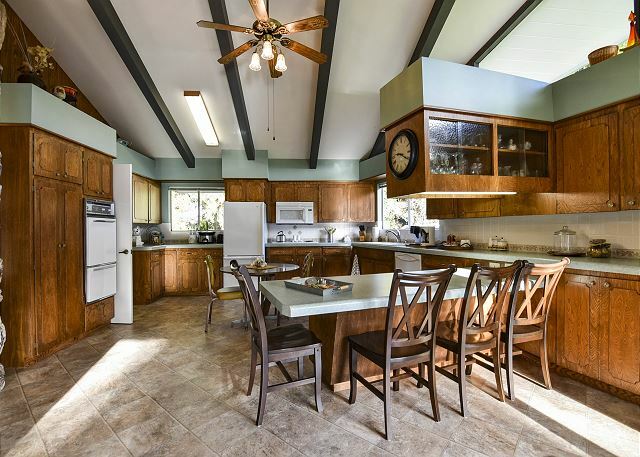 Spacious and open kitchen, corner dining area with exciting views, open living room and 2nd tv (or nature) viewing area. 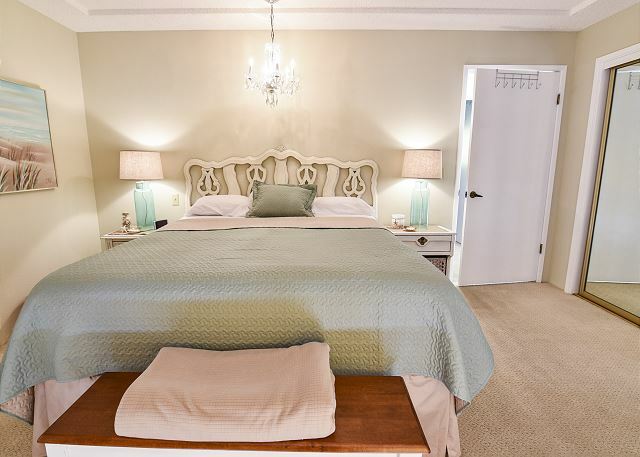 Master bedroom has king bed with private bathroom, two bedrooms have queen beds with a full bathroom down the hall and laundry room. The deck wraps around the entire south and east sides of the house, has a BBQ, and there is a sliding door into the kitchen, so many outdoor meals await you! Once you arrive here, you are stepping off the busy freeway of life and entering a quiet, serene, natural setting and you decide how you want to spend your days. 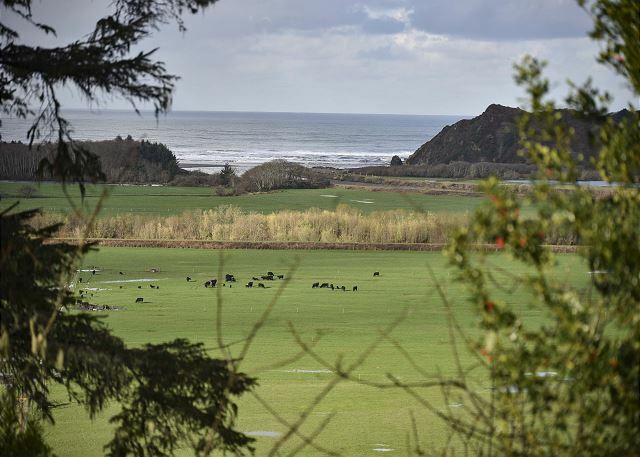 You are truly surrounded by thousands of acres of quiet beaches, stream, creeks, trails, lagoons, Redwoods, & the Pacific Ocean with infinite possibilities. When you look at where you are on the map, you will see the you are just south of the National Redwood Park, just north of Freshwater Lagoon and 2 miles from Lady Bird Johnson Nature Reserve and 6 miles from the road to the Tall Trees Trail (highly recommended, including in the summer when you can swim in Redwood Creek at the bottom of the trail), and only 15 minutes to the fishing Village of Trinidad or 35 minutes to Arcata. 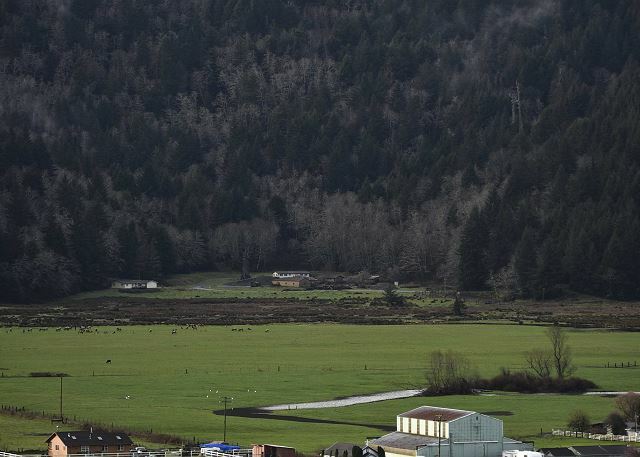 Fun annual events held locally include the Orick Rodeo which takes place in the summer, as well as the Yurok Tribe's Sumeg Village Day, a celebration of the local Native American culture held at nearby Patrick's Point State Park. Please allow 24 hour notice before booking this property. No last minute bookings please! The Viewcrest Retro home is a special place. The home itself is amazingly comfortable and the deck has awesome views of the town and pastures. Love this home! I am tickled that you had such a positive experience and we hope we can accommodate you again in the future. Excellent. Great communication by the rental agency. Very helpful. Thank you for your recent stay at the Viewcrest Retro Home and for your kind words about our staff. We hope you enjoyed your time at this wonderful home and would love to host you again. We had such a fantastic time here. The location is perfect with so many beaches near by and the redwoods right up the road. The house was absolutely lovely. It was very clean, had a spectacular view from the porch and had everything we needed. Thanks for the great review of the Viewcrest Retro Home and for sharing that you had a fantastic time at the house. This is a popular home in Orick, with an amazing deck and comfortable interior. The home is also close to the State and National Parks, making it a good home base for those visiting the area. The home is well stocked and I am happy to hear it had everything that you needed. We loved having you and hope you and your family will return to stay with us again. Thank you for taking the time to write a review of the Viewcrest Retro Country Home. This is a popular home in Orick, near the State and National Parks, with a wonderful view overlooking the town of Orick itself. I am glad you enjoyed it and thank you for letting us know you had a wonderful vacation. We enjoyed staying at Viewcrest Retro Country Home, with easy access to the Redwoods State Forest. We also enjoyed riding with the Buckarettes, going for a two hour horseback ride into the Redwood Forest. The place was spacious and CLEAN with a view of the valley and the distant ocean. It was perfect for relaxing and touring the area. Thanks for taking a moment to leave a review of your stay at the Viewcrest Retro Home. It's a very comfortable home, with a great view and timeless retro furniture. The owners take a lot of pride in the home and I think it shows in the way they decorate and maintain the property between guests. It sounds like you had a fun time in the area and a relaxing time at the house. Thank you for sharing. Please look us up again at Redwood Coast Vacation Rentals when planning your next trip to the North Coast! With over 100+ properties there is something for everyone. Feel free to give me a call if you return, and I will be happy to recommend so other things to do, as well. This was the third Year in a row that we have rented the Viewcrest Retro home. Peace, Serenity, Beauty, Privacy! 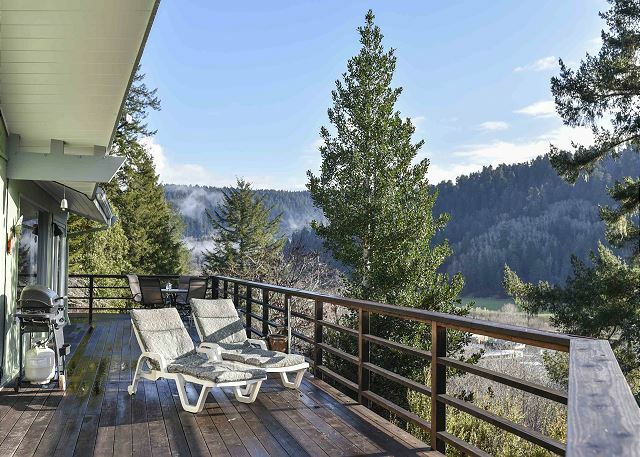 Not only do you have the awesome Redwoods and the Coast, you have this relaxing, private Serenity Home to chill at. Just wish that the home could talk, cuz I know that the home has a very Happy story to tell! You can feel the good vibes. This home has everything that you would ever need. The whole staff at Redwoods Coast Vacation Rentals are the BEST! Thank You for sharing your home with us once again! See you next Year! Very nice. We were surprised at the lack of restaurants or grocery stores in the area. Thank you for choosing the Viewcrest Retro Home. 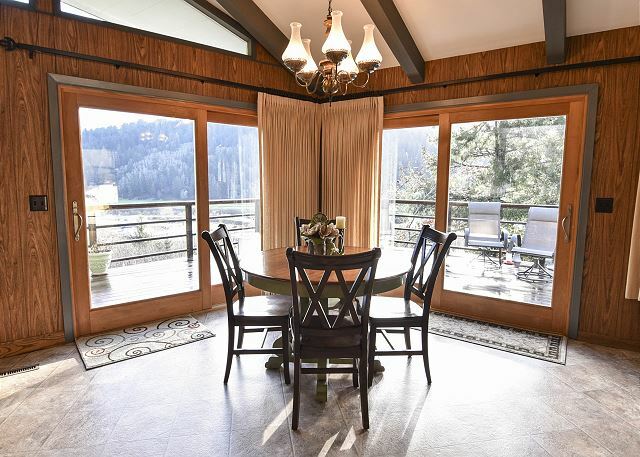 This home is in the town of Orick, most noted for its proximity to the Redwoods and various National and State Parks. While the grocery store and the little market down the road has the basic items most people need, the Palm Café and Edebees are surprisingly good dining spots. Just 15-20 minutes south is the scenic town of Trinidad, with its famous beaches and multiple fine dining and casual dining establishments, as well as a great local organic and non-organic grocery store. A quick call to us and we could have directed you to any particular places to find whatever you may have been searching for. We do hope you did enjoy your time at the home and in the area during your stay and we do hope you will visit Redwood Coast Vacation Rentals again for future stays. 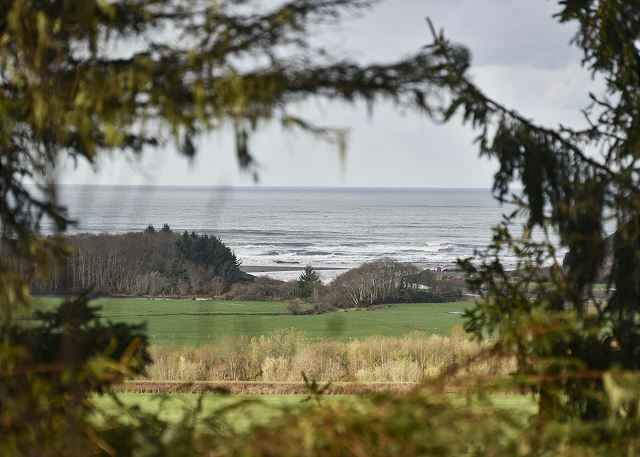 We have over 100 homes along the north coast with nearly every kind of environment to choose from, for your needs. Again, thank you, and we hope to see you again. This home was very spacious, clean, and had great views! The view of the ocean was not as close as we thought from pictures, but the view was good of mountains and Redwoods. So clean we kept thinking we left the sliding doors open. Close to Beaches, Mountains, scenic drives filled with wildlife. Palm cafe had excellent food and friendly staff. Thank you for the review of the Viewcrest Retro home. This is one of my favorite homes. It is very spacious, with great views from the deck, and the home is close to the highway for those seeking the beaches, mountains, and other beautiful scenic drives. I am glad you stopped into the Palm Café. Despite appearances of town, I have had many great meals there and they are known for their spectacular pies! Edebees down the road is good, too. Thank you again for your stay and I hope you will return to visit us again soon. just as advertised. great location to redwoods park.had one window with crack. Thank you for choosing the Viewcrest Retro Home and for booking with Redwood Coast Vacation Rentals. Thank you for letting us know about the crack, we will look into it right away. Please visit us again if you return to the north coast! We were vacationing with our older son and 3 grandchildren, and were thrilled to see that this home was all it said it would be. The home is just lovely and the views from the deck are fantastic. It is located centrally, between state and national parks, as well many other great places to visit. The owners of the home,left a very detailed list of places to visit and do while you are there. (wish more owners did that) There was also and folder on one of the coffee tables with additional information and brochures. Thank you! The kitchen is well stocked with all the utensils, pots, pans and dishes that you will need. We loved driving just a short distance to a park just outside of town every day, where you were pretty much guaranteed to see Elk at least once a day. If you are in this area this is the home to rent! I would definitely come back here if we are ever in the area again. Thank you for the lovely review of the Viewcrest Retro Home. Not much more I can say, so I will let your review speak for itself. We would love to have you back again. What a delightful vacation home! It was in superb shape, roomy, and very clean. We loved the fireplace that warmed us up in the chilly mornings. For us, it was in a perfect spot, very close to the Redwood Forest National and State park which is why we chose it; and also close to Trinidad where we climbed up Trinidad Head which had a beautiful view. Trinidad also has a very nice grocery store where we picked up food, because there isn't anything around the rental except a convenience store that does have some groceries. All in all, it was perfect for us! So happy to hear that the Viewcrest Retro was perfect for you and your family. This home is definitely a delightful vacation home. 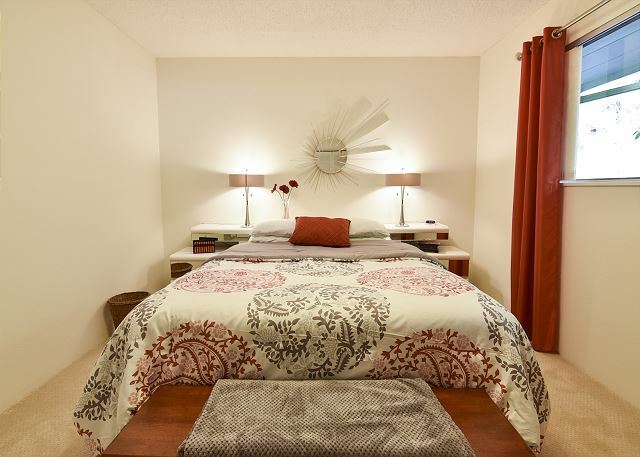 It is very well kept, very comfortable, and accommodating. 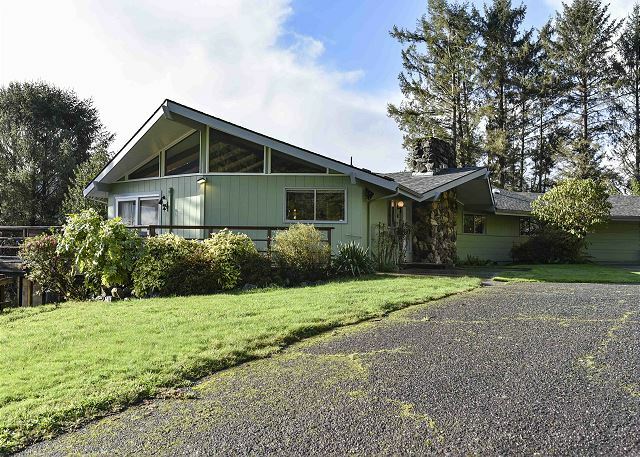 While Orick may not have much to offer in terms of local amenities, this home is close to the redwoods, which makes it such a great place to stay. Thank you for choosing this home, and hope you will be back again. My family had a wonderful, peaceful, and relaxing stay at this home. It’s location near the National Park and National forest was perfect. We were mesmerized by the number of hummingbirds in the tree off the wrap around deck. Thank you for sharing that you had a wonderful stay at the Viewcrest Retro Home. 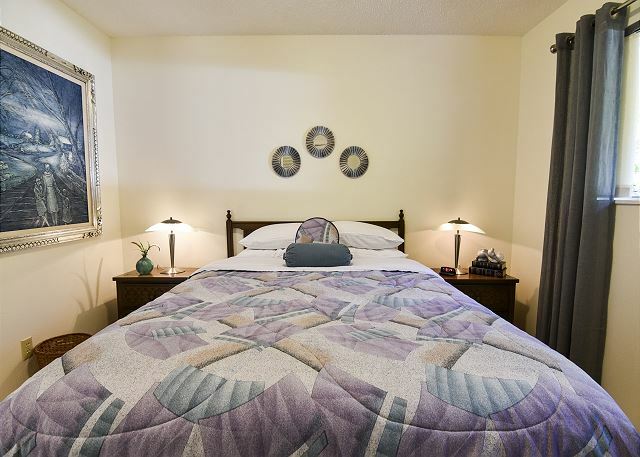 This is one of the most comfortable homes and the location is ideal for visiting the State Parks. Hummingbirds do love the flowers around the yard and they are quite entertaining and beautiful to watch; and the deck is awesome. So glad you had a relaxing stay and if you ever come this way again, please consider us for your future booking. This home is in a beutiful location. Our stay was very peaceful and comfortable. This home has lots of room. The pellet fire place was very nice to relax by on cool evenings. Wish we could have stayed longer. Thank you for the review of the Viewcrest Retro Home and I hope this means you will return to visit us again soon. Home was clean, plenty of space, beautiful view out back. I will recommend it to all my friends that are planning on coming to the redwoods. Would say plan to get your groceries in one of the bigger towns before coming to the home- they have everything to cook meals here, there is only one restaurant and a few small markets that have limited items. Many of the parks major hikes and elk viewing are so close to this home-you do not need to go far, once here! Thank you for your review of the Viewcrest Retro home and the town of Orick. This is one of our more spacious homes with quite the beautiful view off the deck. While the town of Orick is quite small, it does offer two places for dining, a small market, and a smaller market and deli for sandwiches, gas or a quick snack. I highly recommend the town of Trinidad about 20 minutes away for a bit of a larger grocery store with organic and non-organic items, as well as several restaurants in the area. I am pleased to hear you found the home well equipped, and that you would recommend it to anyone planning to visit the redwoods. Again, thank you for your stay and for choosing our lovely home. Excellent home to get away from it all. Great views of the hills and farmland below. Ocean view from part of the deck though a small, wide, tree blocks some of the ocean view. A 40 min drive to Arcata but that is OK in exchange for the quite. A courtesy recommendation to owner to put space heaters in the bedrooms. Overall, a beautiful property. Thank you for the review of the Viewcrest Retro Home. We are happy to hear you had a relaxing stay and enjoyed the views from the home. We appreciate your recommendation and will look into options. We hope you will return to visit us again. Beautiful house. Very clean and comfortable! A hot tub on the deck would make it perfect. The Viewcrest Retro home is a wonderful home. So glad to hear you loved it, and we hope you will return to visit again. Thank you for the recommendation of the hot tub. Were we in an area with greater access to hot tub maintenance technicians, we would definitely recommend. Hopefully, those visiting our area can still enjoy all the nature and beauty the north coast has to offer. First the house is amazing, and very dated (on purpose) and we were very comfortable there with out little family of 5. the town of Orick was unexpected, quaint, and pleasant with access to coast, redwoods, a handful of other state parks, and some really good pie at the local diner. The house itself had everything to cater to nice quiet nights at home as well. this was the best deal I have ever achieved on vacation rentals in general, and the property well kept. the winter months turned out great for a visit to northern california, we will be back for sure! The Viewcrest Retro home is such a delight and step back in time décor. I am glad to hear it was the perfect getaway and you enjoyed your time in Orick. The greater Orick area has much to offer, it is really a hidden gem. I am guessing you had pie at the Palm Café; they are known for their pies and the other little Snack Shack in town makes quite the meals, too. Be sure to try when you visit this way again. This home is well preserved, comfortable, and is perfectly located to visit the state parks and redwoods. We thank you for your stay and hope you will return to visit us again soon. Viewcrest Retro is a very cool house with big windows along the south side. Big and rambling and perfect for of up to six people. Thank you for your recent stay at the Viewcrest Retro Home and for booking with Redwood Coast Vacation Rentals. Please visit us again soon for you vacation needs. Viewcrest Retro is the Best! Peaceful and secluded with awesome views all around. As someone wrote in an earlier review-MAGICAL! The home was extremely clean and had everything that we needed. By far, our favorite house of all time. Not only that, but Redwood Coast Vacation Rental Team Members rock it too! Couldn't ask for better. So much so, that we already scheduled our vacation here for Next Year. This house IS spectacular! So glad you enjoyed your time here and we definitely look forward to your return. Thank you. This was the best vacation ever. The home is fabulous. 100 percent as advertised. I would definitely recommend this home too others. Very positive experience. Property was is great condition and the pictures do not mislead. Would highly recommend to anyone heading to the Redwoods. Enjoyed! Thanks from the great lakes state of Michigan! Thank you for the wonderful review of the Viewcrest Retro Home! It is always great to hear that the home and the visit to the redwoods was enjoyed. If you come this way again, please visit us again! Loved it!! Very clean and loved the mid century modern look. The Viewcrest Retro is a great place to stay! So glad to hear you loved it and we hope you will visit us again here at Redwood Coast Vacation Rentals. We enjoyed the home a lot. It was very clean and convenient to the redwoods. The beds were comfortable and there was everything we needed in the kitchen. Thank you for choosing the Viewcrest Retro Home and for booking with Redwood Coast Vacation Rentals. It is a pleasure hearing you enjoyed your stay and hope we can accommodate you again in the future. Outstanding find! Beautiful, clean house, amazing deck and wonderful views. Glad to hear you enjoyed your stay while at the Viewcrest Retro Home. This is such a wonderful home, with a great view and deck, definitely an outstanding place to stay. Home was lovely, very large, well appointed. Thank you for booking the Viewcrest Retro Home. We hope you will return to visit us again! We very much enjoyed our stay at the beautiful property. Our only issue is our stay was not long enough! The attention to detail was excellent and we enjoyed the retro décor. Really cannot say enough about this property. We loved everything about it. What a great review of the Viewcrest Retro Home; thank you. I hope this means you will return to visit us again and maybe stay a little longer. Great location to visit the Redwoods. Clean and well maintained. As described. Would recommend and enjoy visiting again. Thank you for choosing the Viewcrest Retro Country Home and we hope you will visit us again. The house was perfect! Even better than described and the photos did not do the view justice. Stayed with three generations and all loved the place. Easy to get to shopping in McKinnleyville and right in the center of all of the State and National Parks, the location could not be beat. No neighbors meant peace and quiet, but very steep driveway is something to watch out for if you have very little children. We woke up to Roosevelt Elk in the meadows below the back deck almost every morning. It was magical!!!! As a side note, we contacted management one day because we woke up to a power outage and no water due to a huge storm. Management was very quick to respond and kept us informed. Very responsive and professional! Thanks for loving the home and the nice compliment about our services. Every guest is important to us! Home was comfy and cozy. Wonderful views, saw deer and lots of hummingbirds. Can't wait to come back. We can't wait to have you back! Thank you choosing the Viewcrest Retro home for your stay and we look forward to accommodating you in the future. My husband, sister, brother, and myself rented the Viewcrest Retro Country Home in Orick for the week of Septmeber 24th to October 1st. We enjoyed going back to all the comforts of home at the end of a long day sightseeing and hiking. The location was terrific because it allowed us to venture south to the Avenue of the Giants and north to Brookings, Oregon. We also tried to see everything in between. Sitting on the deck with coffee enjoying the sunrises and viewing the sunset over the Pacific with a glass of wine was the perfect way to begin and end each day. Wow! You were really able to spread out and see much of the beautiful and scenic area in which we live in. From the Avenue of the Giants to Brookings is a big spread, but this home is probably right in the middle. So pleased to hear what a good time you had and we hope you will return to stay with us again. Words can not describe the home! Serenity was the first word that comes to mind. I would rate this home 10+ stars if I could. Secluded, yet so close to the beautiful Redwoods, spotlessly clean inside and out, with everything you need! By far the best in every category for any home we have every had the opportunity to stay in! Thank You for sharing your beautiful home with us and also Thank You to Redwood Coast Vacation rentals for all you do! Wow! What a wonderful review. Thank you so much for your kind words about the Viewcrest Retro Home and Redwood Coast Vacation Rentals. This is truly one of my favorite homes; I am so pleased it was such a good fit for you and your family. Thank you so much for booking with us and I hope you will return to stay again in the future. Property was spotless, convenient to the redwoods and private. Enjoyed the distant view of the ocean and cows grazing in the valley. 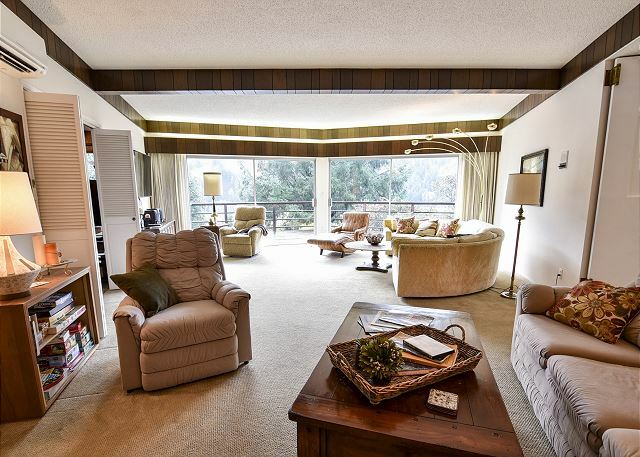 It is 70s style but was well stocked with plenty of room with large sliding glass doors to enjoy outdoors. Highly recommend this property. Thank you for the review of the Viewcrest Retro and for highly recommending this property. One of my favorite properties. I love those views, too! We hope you will return to visit us again on your next visit to the north coast. Thank you for your stay. This was a great escape to a quiet and gorgeous location. The house has a retro feel without feeling old. The decor is eclectic and interesting. The house was comfortable and the kitchen spacious and equipped for preparing meals. The deck nearly all the way around the house was a treat. Close to beaches and redwoods, in the sleepy town of Orick, the house is still close enough to go to Trinidad for a nice dinner or the grocery store. Thank you for choosing the Viewcrest Retro home for your vacation. We are happy to hear it was a great escape and that the house was a good fit. I, too, love that deck, and the proximity to the redwoods, beaches and Trinidad. 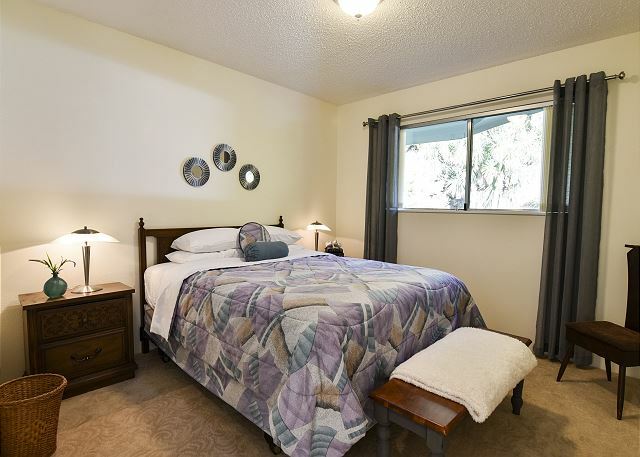 Again, thank you for booking with Redwood Coast Vacation Rentals and staying at the Viewcrest Retro Home. Thank you for your recent booking of the Viewcrest Retro Country Home. We hope you will be back to visit again. The house was a wonderful place to stay on vacation with my wife, 2 young boys, and a set of grand parents. There was plenty of room for everyone and it was nice to be able to come back to a house after each day of adventure. They also did a wonderful job of accommodating my father who is disabled with a prosthetic. The only one item that would have been nice is if all the sliding doors and windows had screens. If they did we probably would have kept the house open all the time due to the wonderful weather we had. The Viewcrest Retro is one of my favorites. I simply enjoy this home and am glad to read that it was a good fit for you and your family. I am also happy that we were able to accommodate your father during his stay. Most homes in our area do not have screens, but I will definitely pass the message along. Thank you again for choosing this home and for booking with Redwood Coast Vacation Rentals. We do hope you and your family will visit us again. '70s retro, fully equipped, clean, great space, wrap around deck, killer views. We love this home! Thank you for booking the Viewcrest Retro Home! We look forward to accommodation you in the future. We traveled from Anaheim CA to Pismo Beach and then onward to Orick, CA the redwoods were amazing and there are a lot of trails that you can go on without having to be a triathlon runner. What a fun house and location to choose for your Redwood Family Trip. The Viewcrest Retro Country Home is one of my favorite homes. Such amazing views and so close to so many attractions. The trails in the area are very nice and I am happy to hear you found the redwoods amazing, because they truly are. Redwood Coast Vacation Rentals thanks you for choosing the Viewcrest Retro home, and we hope you will have the opportunity to visit us again. Absolutely beautiful location. 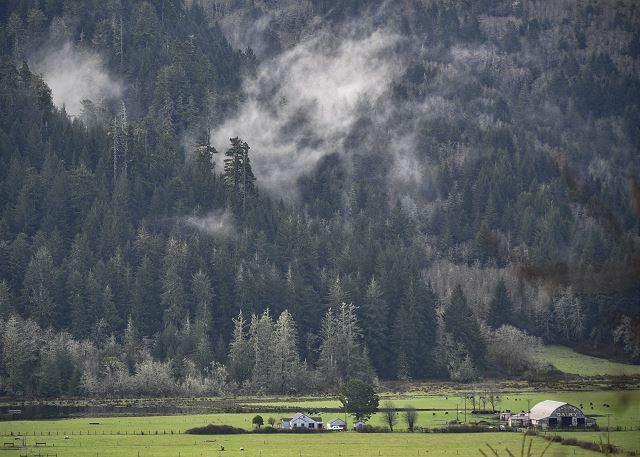 This home is a perfect place for anyone visiting the Redwood forests. Short drive to Fern Canyon and Prairie Creek Visitor's Center and trails, and a short drive from the beach. The property management team was very easy to work with and very responsive. 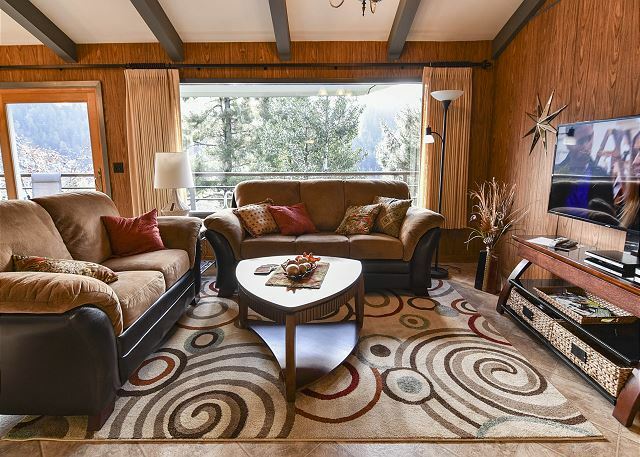 For anyone visiting the Redwood forests, the Viewcrest Retro Home is definitely a perfect place. This home is so close to many attractions and there is much to see and experience right from the home, as well. Thank you booking with Redwood Coast Vacation Rentals. It was a pleasure working with you, and we hope you will return to stay with us again. This was our first experience renting a home for vacation. It was the perfect location for what we wanted to do. The home was perfect. The views from the deck were awesome. The driveway to get to home is steep so be prepared for that. Very nice!! I would rent again! One of my favorite homes! I am glad the Viewcrest Retro was one of your first experiences. It is such a well preserved home and I have to say, the views from the deck are awesome. Thank you for booking with Redwood Coast Vacation Rentals and I hope we will see you again up here on the northcoast. Had our Grandkids with us they filled the house with fun and laughter! It was the first time I rented a house; much better than a hotel:). The kids loved playing outside. The house is close enough for fishing hiking and kid stuff. Having a kitchen was great. 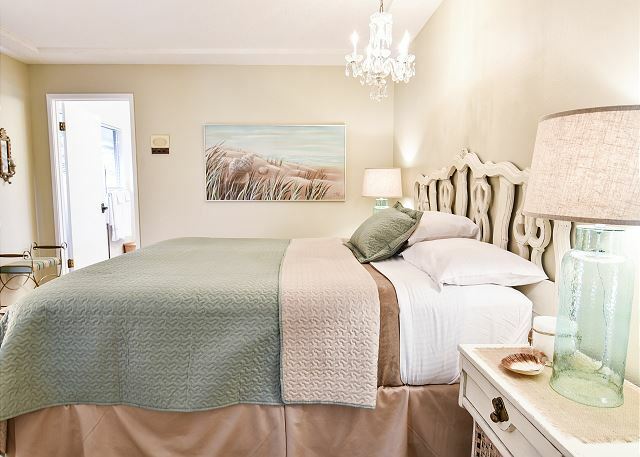 Renting a vacation rental versus a hotel can be a great way to have that "in home" experience with the family while away on vacation that many hotels are unable to offer; so pleased you chose this home for your first rental. The yard and deck are ideal for family time outdoors and the proximity of the house to the Redwoods and local attractions make this home a plus. Thank you for booing the Viewcrest Retro Country Home. Many blessing to you and your family. Four of us stayed in this very spacious home. The decor was late 60's eary 70's and reminded us of furniture we grew up with. The views from the deck were wonderful. We also enjoyed the birds especially the hummingbirds. There is nothing much in "town:. However, we did indulge in some of the best pie ever at the diner. The house had everything for relaxing, cooking and was a wonderful place to launch up to the Redwoods. Thank you for the review Roberta! Isn't this home lovely! I find it completely peaceful and relaxing; and you are right...the views from the deck are wonderful. So glad you stopped at the diner for pie. they have a reputation for good pies, I stop there often myself. Again, thank you for your recent booking of the Viewcrest Retro and please visit us again! The home was in excellent shape, very clean, and the 70s' art deco was spot on. The home was furnished well and the landscaping was stunning. The views from the 180 deg. deck are awesome. 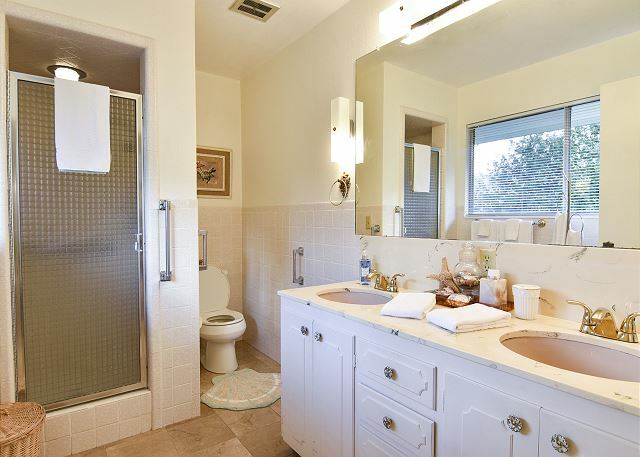 The home is located in a great location in regards to access to parks and the ocean. We could see elk in the distant pastures, and we saw deer and even a small bobcat on the grounds. I recommend this rental a family without hesitation. Viewcrest Retro is a fantastic home overlooking the town of Orick. The views from the deck are a sight to see for me each time I go there, and the location is ideal for those wanting to visit the nearby parks. I am still absolutely tickled you saw a bobcat! Thank you for booking this lovely home and for recommending. I hope you will have the opportunity to visit again. Thank you for the review of the Viewcrest Retro Home. I am glad you enjoyed the location of the home and found it a perfect access point to many of the hikes and trails. I really wish you had given us a call regarding the wifi; upon your check out, we did find that it was unplugged from the wall, and it would have been an easy fix. We do thank you for your recent stay and we hope you will get a chance to visit us again, if not in this home, in one of our many other homes in the area. My husband, two teenage boys and I really enjoyed our stay at the Viewcrest Retro Country Home. The home was well equipped and the perfect space for the whole family to relax. We really loved the large deck and the beautiful views. The home was so close to Prarrie Creek Redwood Park. We hiked and went to the beach everyday. Every evening we went for a beach walk on the beach behind the house. We saw seals and a whale. At night it was nice to have this beautiful, comfortable home to relax in after our day's adventures. If we come back to the redwoods, we will definitely stay here again! Great review of the Viewcrest Retro home. What a treat to see so much nature! I have heard the whales are running right now. This home is in such a great location for visiting the redwoods or simply kicking back and enjoy the scenery and surroundings. Glad your relaxation was achieved and we hope you will stay with Redwood Coast Vacation Rentals again. the retro country home was a beautiful & comfortable home away from home for the week! If you are looking for privacy & the most beautiful green scenery from every room in the house, this is it! My husband, two boys and I loved the wrap around porch, the huge Windows & the tasteful decor along with the modern conveniences of cable & wifi ;) convenient for our hikes to different parts of the Redwood Forest & Northern Cali coast each day! Thank you for the review of the Viewcrest Retro Country Home; what a wonderful place to enjoy the scenery and relax on that deck! Glad the home catered to you and your family and you were able to enjoy the Forest and coast. Hope you get a chance to return to the coast and visit us again soon.